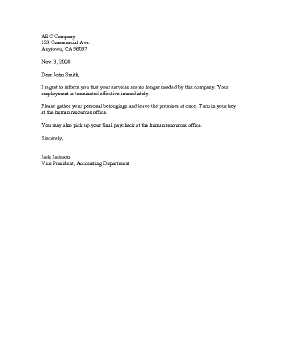 A customizable letter template that serves to notify an employee his or her job has been terminated due to layoff or being fired. I regret to inform you that your services are no longer needed by this company. Your employment is terminated effective immediately. Please gather your personal belongings and leave the premises at once. Turn in your key at the human resources office. You may also pick up your final paycheck at the human resources office.